Whether it's a quiet cup of coffee or a cheerful dinner party, the Thatcher Pub Table and Stools will be the right choice. The pub table comes with a tall X-shaped pedestals with stretches. The tabletop features 18" leaf to expand the table length to accommodate more guests. Also, this dining set includes pub stools with an X-motif on the back and a rich, upholstered fabric seat for plush comfort. Loaded with features, this transitional-style dining set creates a casual, dining experience. This is a timeless set. 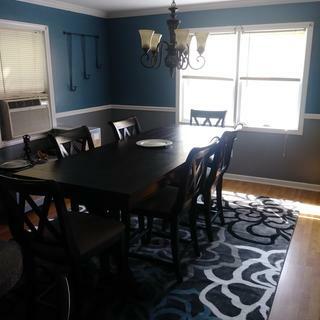 The color is amazing and the fabric on the chairs give it a bit of formality, yet still fun with the "pub like" height. Very functional and with the leaf can fit 10 people comfortably. 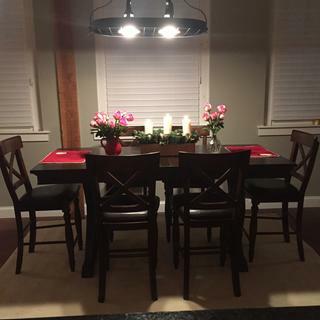 I love my new dining sets! Jordan’s has a beautiful selection, great service and competitive pricing! Excellent dining table and chair set. I would recommend anything from Jordans. Great service and easy to purchase. Hassle free. Very happy with my new kitchen table! Maureen was a wonderful sales person! We had a great experience! Would definitely recommend again! Is the table 76 inches with the leaf or without? The Thatcher Pub Table is 76" long without the leaf. The leaf extends the dimension to 94".